STUDIO ACCESS: Studio members have access to FAC from 6 a.m. to 12 midnight, seven days a week. However, students and their instructors have priority on both space and equipment when classes are in session. Other than when enrolled and participating in scheduled instruction, any student or guest under the age of 18 must be adequately supervised by a responsible adult. USE OF EQUIPMENT: All equipment—including glass cutter, glass lab, glass kilns, potter's wheels, slab rollers, extruders, bisque kilns, raku kilns, gas kilns—is available for studio member's use after the studio member has been cleared or trained to use it. All equipment will be kept in good working order to the extent that funds are available and approved by the Board. 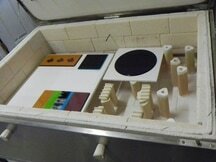 Kilns are fired only by staff or by studio members who have been authorized to do so by the staff. 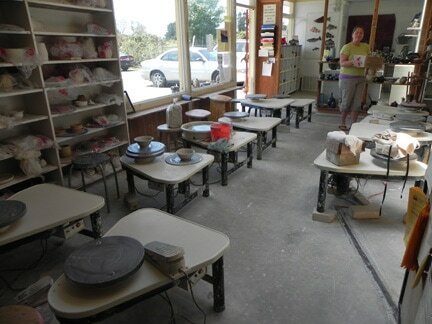 Kiln space is limited. 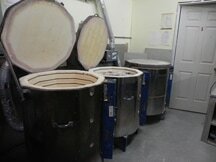 Additional fees apply whenever a member exceeds allotted kiln space. STORAGE SPACE: Clay, tools, and work in progress may be kept in the Studio. The space allotted to each paid studio member will be determined by the amount of available space and the particular needs of that member. GALLERY EXHIBITS: Studio gallery exhibits allow studio members to display and sell their work with minimal effort and with a commission to FAC lower than that of most private galleries. ANNUAL SALES: Two or three 2-day sales per year allow studio members even greater opportunities to exhibit their work and receive a commission for any work sold. During these events, which are held at the Fire Arts Center, workspace will be limited. We encourage all members to take a short break from their craft and volunteer at the sales. DISCOUNTED CLASSES: Studio members in good standing receive discounts on all Fire Arts classes, once minimum enrollment for the particular class iis met. ​COLLEGIAL ATMOSPHERE: The Fire Arts Center offers a vital artistic program and a non-competitive working environment. Studio members are expected to share their knowledge and skills with fellow members and help foster the collegial atmosphere that has become the heart of FAC's success. WEB EXPOSURE: Full time members of 6 months or more continuous membership can enjoy a web page on the Fire Arts website, including a link to their own website if available. It will be the member's responsibility to supply their bio and pictures to the web administrator.